Freestyle, Race and Big Air Divisions. The best day for the contest will be chosen and finalized 72 hours before the contest occurs (within the parameters of the two designated weekends) based on the best wind conditions available. On the chosen contest day Registration will open from 8am-10am, rider meeting at 10:30am, then begin heats at 11am. The contest format will be 12 minute freestyle heats with 3-4 competitors per heat, followed by a semi final and then a final. We anticipate this process to be anywhere from 3-4 hours long. Once the freestyle competition is concluded we will immediately start a short course race with a windward leward race course, which should take anywhere from 20 minutes to an hour. We will aim for awards ceremony to be around 5 pm, however if we have time we will try to run a "Big Air" contest(only if we have time). We will bring in 2-3 judges with experience in the freestyle discipline to help judge the contest. We will also bring in 5-10 volunteer students to help run the event. Last edited by fsukiteboarding; 02-07-2014 at 07:49 PM. * OFFICIAL 72 HOUR NOTICE FOR CKA TOUR STOP #2: As of Wednesday 1/29/14 the wind forecast for Biscayne Bay is looking adequate for us to host the comp this Saturday Feb 1st. Stay tuned for our 48 hour update tomorrow Thursday 1/30/14 to confirm whether or not the contest will happen this weekend 1/2 of January. 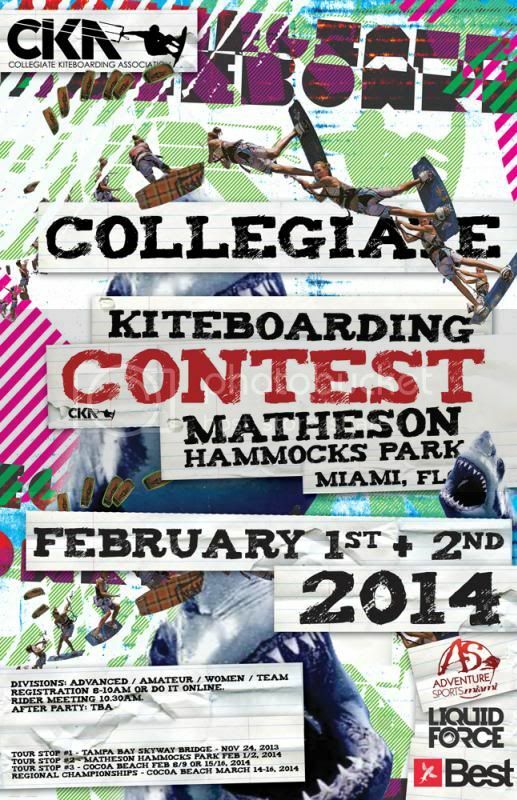 *PLEASE keep in mind that there are also comps scheduled for the following weekends in Cocoa beach! * OFFICIAL 48 HOUR NOTICE FOR CKA TOUR STOP #2: As of Thursday 1/30/14 the wind forecast for Biscayne Bay is still looking adequate for us to host the comp this Saturday Feb 1st. * Stay tuned for the final 24 hour update tomorrow Friday 1/31/14 to confirm Divisions will run and the day of the contest. It is is very important that your Team shows up at the correct time to ensure that we can run the best Division to suit the wind conditions. * Note we are modifying the Rules to favor Teams with mulitple competitors. * PLEASE keep in mind that there are also comps scheduled for the following weekends in Cocoa beach! LIGHT CHOP. A SLIGHT CHANCE OF SHOWERS. MODERATE CHOP. A SLIGHT CHANCE OF SHOWERS IN THE AFTERNOON. EAST SOUTHEAST WINDS 8 TO 13 KNOTS. BAY WATERS A MODERATE CHOP. EAST WINDS 6 TO 10 KNOTS. BAY WATERS A LIGHT CHOP. * OFFICIAL 24 HOUR NOTICE FOR CKA TOUR STOP #2: it is with much regret that we have to cancel the event this weekend due to an inadequate forecast. CKA's main objectives for events are that 1) they are legal (insured + permited) 2) competitors are CKA members 3) windy - it really defeats the purpose to have a windless event. Next weekend's event in Cocoa beach will be rename Tour Stop #2 and this this event is getting pushed back to weekend of either Feb 22/23 or March 1/2. It will then become Tour Stop #3 which is the final event before Regionals in Cocoa March 14-16. Thanks for your patience! Don't forget to get filming and submit your entries to the Video Competition! 2. CKA Scholarship. This appeal is to raise funds to help pay for college kiter's travel costs to Nations. We have not had any backers in over a week! Please help by making a donation! 3. Video Comp. There is little over a month to submit your entry. Don't leave it to the the last minute so you can get some views!